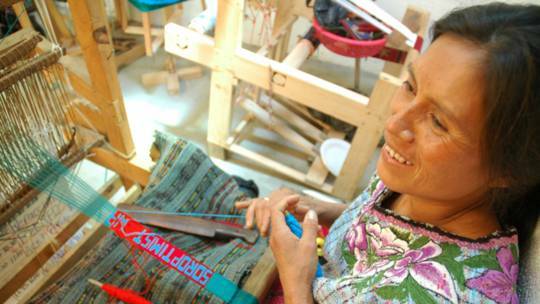 Candelaria's weaving group in Guatemala were able to buy materials and find a workshop because of support from CAFOD. Guatemalans live in one of the most unequal societies in the region, with 70 per cent of land owned by less than one per cent of the people. Most live in poverty, especially in rural areas. Illiteracy, infant mortality and malnutrition rates are high, while life expectancy is low. In common with many of its neighbours, the country suffers from violence generated by organised crime, drug-trafficking and street gangs. Indigenous communities are often marginalised, with discrimination leading to repression of their culture, ethnic identity and economic opportunities. Many are dependent on family members working overseas, in the US in particular, to survive. Guatemala has the highest incidence of malnutrition in Latin America with just under half of children under the age of five suffering chronic malnutrition.